No routing needed. No hand-tooling of any of the plastic bits, in fact (if I've got it all right). The extruder is now swappable and is compatible with the Darwin swap design (if I've got the measurements right on this one too). 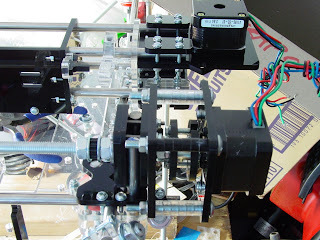 I have put 2 extruder mechanisms on the sheets so you have something to change. The Z motor can be replaced by a GM3-type gear motor and rotary encoder. I've made the Z motor bracket so it can use opto sensors and a variety of other gear motors too. Ball-chain is used in place of all belts. The larger 4.5mm chain (either of 2 variants) is used for the Z axis, X and Y can use either 3.3 or 3.5mm ball chain. X & Y axes can be fitted with NEMA17 steppers. The Y opto flag can be placed on either side of the X carriage so we remain compatible with Ian's design. The X carriage may be removed without disassembling the carefully-aligned frame. The corner bracket parts that Ian reported his clients broke a lot are now cut from 8mm acrylic instead of 4.5mm - and I've included a spare. Just submitting them for the Final Cut (thank you Pink Floyd). Ideally we want solid-state, but presently CO2 may be easier to get. We could mount a solid state one on the head; CO2 would have to be done with mirrors or optical fiber. We obviously want an easily collimated narrow parallel beam. We'll probably also need an air jet (and some ventilation), but I think those are pretty straightforward. So. Does anyone know of a cheap simple IR laser? A Dremel with a flexible shaft costs about $100 and can cut 2.5-D, that is it can mill 3D shapes after a fashion instead of just 2D. As well, while I'd trust a 12 year old with a Dremel, I know for sure I wouldn't trust one with a 40 watt laser. Have you any piccys of the Z Axis with GM3 ?????? The Z-axis with a GM3 is one of the few parts I've not made up yet - it is in the final cut though and I should have it in about a week. I'm fairly confident of this one working as it is just a simple amalgamation of the GM3 holder from the extruder and the Z stepper bracket. $200 or less is extremely unrealistic for the next few years. Forrest's suggestion about building a machine that can take a spindle and do light machining seems like a more profitable direction of inquiry in the short term. (In the long term, I want a laser-cutter too). Yeah, if I understand what you've done correctly, it is to take all the RepRap parts and arrange to cut them with a laser cutter. But, the RepRap doesn't have a laser, so a LaserCut RepRap is really just a bootstrapping device (a surrogate womb): it can never reproduce itself. As such, I don't understand the point.